With the Paris agreement freshly on everyone’s mind and in the media 2016 started of as a very exciting year for climate science. On a global scale it took slightly unexpected turns but from a scientific point of view 2016 was a year to celebrate in particular for CPDN. With respect to our knowledge and understanding of the climate system and the interaction between weather and climate we, the climate science community, made huge progress to no small degree thanks to CPDN, the teams of academic researchers from partner groups around the world but most importantly the volunteers. Without you, the volunteers, there would be no very large ensemble simulations of possible weather and without that our ability to undertake research about rare and extreme weather events would be greatly limited. Moving into 2017 we, the climateprediction.net and weather@home teams would like to take this oppurtunity to provide a very brief summary of activities and successes over the past 12 months to show what your continued engagement with us has led to AND of course say a big fat thank you to all of the volunteer community, without whom none of this would be possible. CPDN is unique in providing large ensembles that enable us to simulate statistics of extremely rare events hence the main focus of our work has been on extreme weather and in particular its attribution to external climate drivers. Whenever an extreme event happens in the world “was it climate change?” is one of the first questions being asked. With our World Weather Attribution (WWA) project we provided a scientific answer to that question, in real time, for example for the floods in Paris and Southern Germany in May and the Arctic Heatwave just before Christmas. And the media did register our efforts and reported on it broadly with, by and large, great scientific accuracy. Apart from providing attribution information when it is needed most the team did a lot of work on the methodological development of extreme event attribution methods using CPDN data and published this in the peer reviewed literature (1-9). A particular highlight of all these publications is the proof of concept paper on real-time attribution by Karsten Haustein et al. and the first end-to-end attribution study, from the atmospheric circulation to inundated properties ever in Schaller et al. The team did not only look at specific events however but also published a number of conceptual papers on attribution as a science, CPDN as a unique capability and climate modelling in general (10-15). 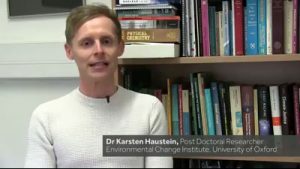 All these publications answered some important scientific questions but also highlighted other questions, that still need to be addressed and provide new challenges towards scientific evidence of the impacts of external climate drivers. The National Academy of Science in the United States commissioned an assessment of the state of the science which was published in March. For CPDN this publication was fantastic news as it concluded that the way WWA approaches the attribution of extreme events is the best way possible to make use of all available science. Many of these scientific publications are the result of collaborations with scientists around the world in the international teams of our research projects that make up the science teams of CPDN. EUCLEIA, a european project that ended this year, did not only explore many of the challenges and limitations of extreme event attribution but in particular fostered and strengthened a scientific community that will live on in other projects for the coming years. With WWA, CPDN has been part of the first science team ever to provide real-time event attribution but with it’s new 2016 spin-off RRA, WWA and the EUCLEIA legacy will generate a global community and enable in particular scientists from developing countries to become active members of this community. The ground work to make this possible not only came from WWA but also from the NERC funded CPDN project ACE-Africa which ended in 2016. A main achievement of this project beyond the scientific findings is to provide the necessary climate model simulations to explore the impacts of climate change under 1.5 and 2 degrees. New and unique model simulations have also been made available through the MaRIUS project under which CPDN created a very large ensemble of possible weather and extreme weather in Europe from the beginning of the 20th century up to the end of the 21st. A different focus of the world has another new project largely relying on CPDN’s modelling infrastructure, LOTUS. A collaboration with the University of Edinburgh, the UK Met Office and various Chinese universities. Under the new project GOTHAM, CPDN is not only a key partner in an international consortium to explore the drivers of global teleconnection but offer another 2016 CPDN development, a training course on how to use the CPDN infrastructure to desgin climate model experiments, to all members of the consortium but also any scientist who applies to the first CPDN summer school. Alongside the scientific advances that have been enabled by CPDN we have also made a significant number of advances within the underpinning technological system upon which CPDN and W@H depend. 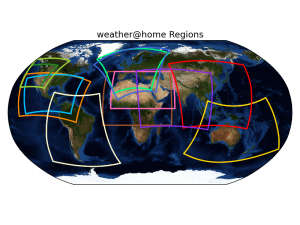 This has included transitions in the configurations of models that we run, in particular away from the individual regional Weather@Home1 applications. These were a significant maintenance load as we developed more and more regions we wanted to work with simultaneously. This has led to the development of the single region-independent Weather@Home2 application, within which we could dynamically pick the region of interest, resolution (25 or 50km) and even the time length of individual work units depending on scientific requirements. This allows us to simplify the number of individual applications that we are running as well as engage with more and more different research questions and hence collaborations. As you can see below we have dramatically expanded the regions on which we are able to study. We understand that there are still some issues and are thereby making the full roll out onto all platforms of all models a priority. At the beginning of the project we only deposited data within Oxford or Rutherford laboratory, expanding to both Oregon and Tasmania as further projects were funded. Within 2016 this has increased with the commissioning of further upload servers around the globe including Mexico, South Korea and India. We have strived to rationalise the upload servers moving towards a common deployment mechanism for them all. This will allow us to more rapidly deal with problems by redeploying servers on timescales relevant to allow continued uninterrupted operations in the case of infrastructure problems. The two snapshots representing our longstanding partnerships give an idea the possibilities arising from new partnerships in Mexico, South Korea, India, Kenya and Ethiopia in 2017 and beyond. During 2016, the Oregon State University team made progress on three experiments. The first attempts to improve regional climate model simulations of both the climate and vegetation of the western US. A central part of this experiment is exploring the sensitivity of energy fluxes, water transport, and vegetation distribution to model parameters. The second experiment investigates future forest health by looking at projections of climatic forest stressors into the mid-21st century. Lastly, the third experiment asks this specific question: Did anthropogenic greenhouse gases increase the probability of major bark beetle outbreaks in western North America during the first decade of the 21st century? A warmer and drier growing season can reduce the vigor of trees increasing their susceptibility to insects and in recent years bark beetles killed many white bark pine trees throughout the western US and British Columbia. Results from prior experiments were also published this year. These include studies that explored the role of anthropogenic greenhouse gases in the Central US drought of 2012 (8) and the 2015 “snow drought” of the US west coast states (2), as well as our first looks at the future climate of the western US as simulated by weather@home (9,18). perturbed physics simulations, to assess the role of variations in some of the model’s physical parameters on the distributions of daily rainfall and temperature extremes. In total, more than 100,000 years of simulations have been completed and most have been analyzed. Significant outputs during the year include publication of the paper describing the weather@home ANZ modelling system and the evaluation of its performance (10). Two papers analyzing extreme events in 2015 in Australia using the 2015 simulations were published in the 2016 Bulletin of the American Meteorological Society supplement on Explaining Extreme Events. These examined the record high temperatures in October 2015 in southeast Australia and the record low rainfall in Tasmania in October 2015 (20,21). Mitchell Black also completed and submitted his PhD thesis in October 2016, which used all these simulations. Examiners’ reports have been received and recommend minor revisions only. Mitch was the key person involved in setting up and running the w@h ANZ experiments for the last three years and he has now moved to a postdoctoral research position in CSIRO. Andrew King at Melbourne University and Sue Rosier at NIWA in New Zealand will take greater roles in setting up and running w@h ANZ experiments in 2017. Haustein, K., Otto, F.E.L., Uhe, P., Schaller, N., Allen, M.R., Hermanson, L., Christidis, N., McLean, P. and Cullen, H. (2016) Real-time extreme weather event attribution with forecast seasonal SSTs. Environmental Research Letters, 11(6). 064006. Mote, P., Rupp, D., Li, S. Sharp, D. Otto, F., Uhe, P., Xiao, M., Lettermaier, D., Cullen, H. and Allen, M. (2016) Perspectives on the causes of exceptionally low 2015 snowpack in the western United States. Geophysical Research Letters: 10980-10988. Schaller, N., Kay, A.L., Lamb, R., Massey, N.R., van Oldenborgh, G.J., Otto, F.E.L., Sparrow, S.N., Vautard, R., Yiou, P., Ashpole, I., Bowery, A., Crooks, S.M., Haustein, K., Huntingford, C., Ingram, W.J., Jones, R.G., Legg, T., Miller, J., Skeggs, J., Wallom, D., Weisheimer, A., Wilson, S., Stott, P.A. and Allen, M.R. (2016) Human influence on climate in the 2014 southern England winter floods and their impacts. Nature Climate Change. Sippel, S., Otto, F., Forkel, M., Allen, M., Guillod, B., Heimann, M., Reichstein, M., Seneviratne, S., Thonicke, K. and Mahecha, M. (2016) A novel bias correction methodology for climate impact simulations. Earth System Dynamics, 7(1): 71-88. Uhe, P., Otto, F.E.L., Haustein, K., van Oldenborgh, G.J., King, A.D., Wallom, D.C.H., Allen, M.R. and Cullen, H. (2016) Comparison of methods: Attributing the 2014 record European temperatures to human influences. Geophysical Research Letters. Vautard, R., Yiou, P., Otto, F., Stott, P., Christidis, N., van Oldenborgh, G.J. and Schaller, N. (2016) Attribution of human-induced dynamical and thermodynamical contributions in extreme weather events. Environmental Research Letters, 11(11). 114009. Black, M. T., Karoly, D. J., Rosier, S. M., Dean, S. M., King, A. D., Massey, N. R., Sparrow, S. N., Bowery, A., Wallom, D., Jones, R. G., Otto, F. E. L., and Allen, M. R.: The weather@home regional climate modelling project for Australia and New Zealand, Geosci. Model Dev., 9, 3161-3176, doi:10.5194/gmd-9-3161-2016, 2016. Mitchell, D., Davini, P., Harvey, B., Massey, N., Haustein, K., Woolings, T., Jones, R., Otto, F., Guillod, B., Sparrow, S., Wallom, D. and Allen, M. (2016) Assessing mid-latitude dynamics in extreme event attribution systems. Climate Dynamics. Otto, F.E.L. (2016) Extreme events: The art of attribution. Nature Climate Change, 6: 342-343. Otto, F.E.L., van Oldenborgh, G.J., Eden, J., Stott, P.A., Karoly, D.J. and Allen, M.R. (2016) The attribution question. Nature Climate Change, 6: 813-816. Montes, D., Añel, J. A., Pena, T. F., Uhe, P., and Wallom, D. C. H.: Enabling BOINC in Infrastructure as a Service Cloud Systems, Geosci. Model Dev. Discuss., doi:10.5194/gmd-2016-193, accepted, 2016. Uhe P, Otto F.E.L, Rashid, M.M. and Wallom, D C.H. Utilising Amazon Web Services to provide an on demand urgent computing facility for Climateprediction.net. IEEE eScience 2016. Rupp, D. E., S. Li. 2016. Less warming projected during heavy winter precipitation in the Cascades and Sierra Nevada. International Journal of Climatology, doi:10.1002/joc.4963. Mote, P. W., M. R. Allen, R. G. Jones, S. Li, R. Mera, D. E. Rupp, A. Salahuddin, D. Vickers. 2016a. Superensemble regional climate modeling for the western US. Bulletin of the American Meteorological Society (97), 203-215, doi:10.1175/BAMS-D-14-00090.1.